Recently while surfing the Twittersphere I came across an incredibly moronic tweet by the everlasting twit that is Mark Ames, who likes to make alot of noise about "Russophobia" that is supposedly rampant in the media. Though I have occasionally retweeted him as he does produce the odd good tweet. You really have to wonder in amazement, and a slight tinge of disgust, at the implication Ames and his co-'thinkers' are trying to push here. The implication is obviously that to have criticisms of the increasing authoritarianism of the Maduro regime in Venezuela and to refuse to ignore and throw under the buse the victims of Baathist totalitarianism in Syria is to be a neoconservative (I know, makes no sense either). Supporting popular revolutions against tyrants was practically Leftism 101. Now, according to some, this position makes you a 'neocon', even if you are against Western intervention and, in the case of Venezuela, criticise opportunistic, power craving rightist forces you're still a 'neocon'. How can Mark Ames (and others, Ames wasn't the only one) with a straight face and a clear conscience chuck buckets of slime at those who have temerity to hold an opinion that does not step in line completely with stultifying orthodoxy? Seriously, if a leftist can't support, or at the very least engage with, democratic revolutions worldwide then what is there to being a leftist? I do not consider any ideology that is not interested in supporting democratic movements worldwide as 'left'. Nor could I call anything 'left' that is provincialist, not internationalist, that believes in 'socialism at home but fascism and counter-revolution abroad'. Democracy is the soul of socialism, without it it means nothing. Which is why the struggle for socialism should always be married with the struggle for democracy. "To educate the masses politically does not mean, cannot mean making a political speech. What it means is to try, relentlessly and passionately, to teach the masses that everything depends on them; that if we stagnate it is their responsibility, and that if we go forward it is due to them too, that there is no such thing as a hero that will save them with his magic hands, that there is no famous man who will take the responsibility for everything, but that the hero is the people themselves and the magic hands are finally only the hands of the people." "If we want to overthrow the regime of Uzebekistan, now a great favourite, but it happens to be not very different to the Taliban, the way to do it would not be to bomb Uzbekistan, but to support internal democratic forces and let them do it. And that generalises around the world"
I completely agree with this. This should be the left's response to neoconservatives and the liberal hawks. The idea that the United States is an 'Empire of Liberty' has always struck me as oxymoronic nonsense. It should be axiomatic that liberty and imperialism cannot co-exist, given the long history of blood stained dictatorships America has sponsored and, in a few instances, directly imposed upon free peoples. Problem is when a popular revolution actually did happen in Syria as part of the Arab Spring, both Chomsky and Ali after some ambivalent support, engaged in relativising Assad's atrocities and those of his sponsors, Russia and Iran; churning out a simplistic and false narrative that puts the blame for the conflict on the United States for pursuing an aggressive "regime change" policy a la Iraq. Even going as far, in the case of Ali, as defaming the revolution's advocates as "Al-Qaeda supporters", even when they support unarmed groups like the White Helmets. That I guess the real difference between us is not whether we acknowledge the existence of these movements, but whether we truly value them or not. I have grown extremely irritated to the point of tedium at this false dichotomy that has developed on the Left where you are either against Western crimes but apologise for any tyrannical regime that so happens to be anti-Western in the name of a morally vaccuous "anti-imperialism". Or you rightfully condemn the crimes of these regimes but relativise, and in some cases support, the crimes of the Western powers simply because 'we' committed them not the other guy. These two positions are untenable for anyone who cares about socialist internationalism or a genuine anti-imperialism that is based on solidarity with people struggling for emancipation not protecting oppressive states. We should refuse the nasty distinction of 'worthy' and 'unworthy' victims based on who is the one holding the whip over them. We should be against both the Western sponsored Saudi bombings in Yemen and Russia's bombings in Syria. We should simultaneously support the overthrow of Assad in Syria and support the overthrow of the Western backed Sisi dictatorship in Egypt. We should call for the ouster of the regressive and barbaric Wahabbi theocracy of Saudi Arabia and the no less regressive and barbaric Shia theocracy of Iran. One can strive to arrive at this morally consistent internationalism without becoming a 'cruise missile liberal' or a 'state department socialist'. 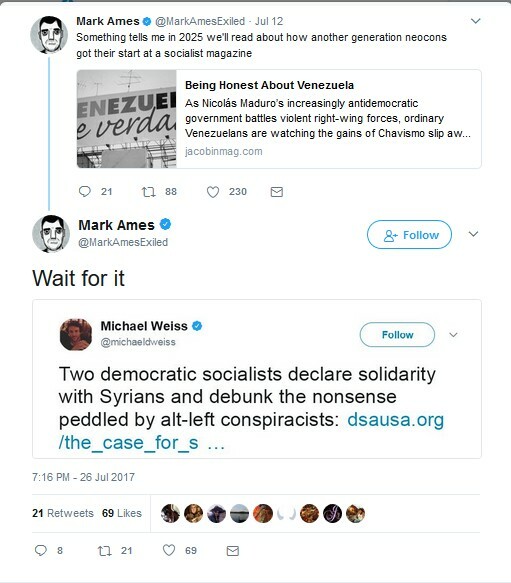 If criticising the authoritarianism and the complete abjectness of Maduro, and if expressing solidarity with the popular forces hanging on for their lives in Syria, against the double counter-revolutions of Russia and Iran and Al-Qaeda and ISIS, makes me a neoconservative (which is laughable) then so be it. I would rather be called a name I don't like than compromise my principles. And you should either.